If you approach High Wood (Bois des Fourcaux) in northern France you find a flourishing stand of sweet chestnut trees on a 150-metre high promontory, their green crowns clustering in the breeze. The 30-hectare wood overlooks nearby straight roads, wide fields of cereals and beets, symmetrically ploughed slopes and large, unfenced paddocks which sweep up to the hill, a high feature of the gentle countryside. Now he was in fields in France that were destroyed, with the ground heavily cratered, the trees obliterated, just a stark set of bare trunks, stumps and shattered timber on a blasted hill. Some 87 days of fighting had included constant heavy artillery barrages, with a week-long bombardment before the battle began on July 1 that saw more than a million shells lobbed into the area. For nearly three months, machine gun enfilades had constantly splintered the entire wood. Rainy autumn days in September had turned the moonscape terrain into a quagmire as the New Zealand Division went into action for the first time on the Western Front. In the midst of withering machine-gun fire, Sergeant Brown was about to earn a Victoria Cross. It was awarded to him for “most conspicuous bravery and determination in attack (south-east of High Wood, France, on September 15, 1916), when the company to which he belonged had suffered very heavy casualties in officers and men from machine gun fire.” The citation continues: “At great personal risk, this NCO [Non-commissioned officer] advanced with a comrade [Sergeant Jesse Rodgers, Military Cross and Military Medal for bravery in the field] and succeeded in reaching a point within 30 yards of the enemy guns. This eight-day battle of Flers-Courcelette finished on September 22 with the allied forces capturing High Wood and, to the north, the battle-shattered villages of Flers, Courcelette and Martinpuich, an advance of around three kilometres against heavy German resistance. But the well-entrenched German army and the stubborn persistence of the allied commanders meant the battle of the Somme still had two months to run of its ghastly course. The cold statistics tell the story, as the Imperial War Museum records. From the well-known toll of the first day on July 1, 1916, when British forces suffered 57,470 casualties of which 19,240 were killed (the artillery bombardment failed to cut the barbed wire in front of the German lines and destroy trench defences and artillery), the five-month battle cost the Allies 600,000 casualties – killed, wounded or taken prisoner – and the Germans over 500,000. German losses were kept high by their policy of launching repeated counter-attacks in attempts to recover lost ground. Historian Terry Norman, in his book, The Hell They Called High Wood, records that after the British 47th Division suffered more than 4500 casualties over four days of fighting, divisional commander Major-General Charles Barter was sacked for "wanton waste of men”, a charge never brought against the High Command. Barter was soon exonerated in an informal investigation, knighted and sent on a mission to Russia. The Imperial War Museum history of the Somme quotes General William Furse lamenting, “We are squandering our men...partly because of indifferent Art[illery], partly because of indifferent ammun[ition], partly because of indifferently trained infantry” and French general Charles Mangin stating flatly, “whatever you do, you lose a lot of men”. In July, the German casualties for the six regiments defending High Wood totalled almost 10,000, of whom nearly 2000 were killed. In August, the 51st Division lost more 2000 men and 120 officers in just two weeks of fighting in and around High Wood. In September when the German collapse was complete, and High Wood and the adjacent Switch Line were in British hands after two months and three days of almost incessant shelling and fighting, the 47th (1/2 London Division) suffered 4500 casualties in the final four days of the battle. On October 1, the New Zealand Division with Sergeant Brown's Otago Regiment was back in the line for the attack at Le Transloy, eight kilometres east of Flers. Persistent rain meant the battleground was now a swamp. The citation for his Victoria Cross records: “Sgt. Brown showed most conspicuous gallantry. 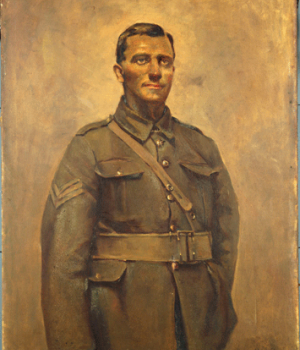 He attacked, single handed, a machine gun which was holding up the attack, killed the gun crew, and captured the gun.” While New Zealand troops were following up with an attack, Brown was shot and killed by a sniper. His service record is a mere seven lines, from the time of his enlisting with the Otago Regiment on October 19, 1915, being promoted to sergeant on April 1, 1916, embarking for France from Alexandria in Egypt on April 9, then being killed in action. He had been in the army less than a year. He is buried in Warlencourt British Cemetery, seven kilometres from the battlefield of Flers where he earned the VC. The battle of the Somme ended officially on November 18, with more than a million casualties from both sides. The NZHistory website of the Ministry for Culture and Heritage records that “It took a huge toll on the 18,000 members of the New Zealand Division who were involved. More than one in nine of the division who fought on the Somme was killed and about one in three was wounded. Whereas New Zealand’s eight-month campaign at Gallipoli cost 2700 lives, more than 2100 men were lost in just 45 days on the Somme. “More than half the New Zealanders who died on the Somme in 1916 have no known grave. Some, unidentified, lie in cemeteries with their headstones inscribed ‘Known unto God’; the rest remain lost on the battlefield. All of these missing soldiers, more than 1200 men in all, are inscribed on the New Zealand Memorial to the Missing in the Caterpillar Valley Cemetery, west of the village of Longueval. New Zealanders are buried in dozens of cemeteries in northern France – Caterpillar Valley Cemetery, Dartmoor Cemetery, Warlencourt British Cemetery, Bulls Road Cemetery, Thiepval Cemetery among them. Dr Payne notes that the crater caused by British sappers blowing up a 1300 kg mine under German lines at the eastern corner of High Wood still exists today, but is now a ten-metre deep pond. There are memorials to the divisions that fought at High Wood all around the area. But entry to the wood itself is not permitted. Dangers from unexploded munitions are understood, but the owners of the wood are equally protective of the solemn nature of the site, a de facto war cemetery. An estimated 10,000 bodies of British allied and German forces remain unrecovered there.